The Darkness is here, and it could be Sam and Dean’s biggest battle yet. Supernatural Season 11 Episode 1 was full of seemingly powerful bonds, deathly infections, and the Winchester brothers looking to make a change. But can they? And might we see the return of Lucifer? 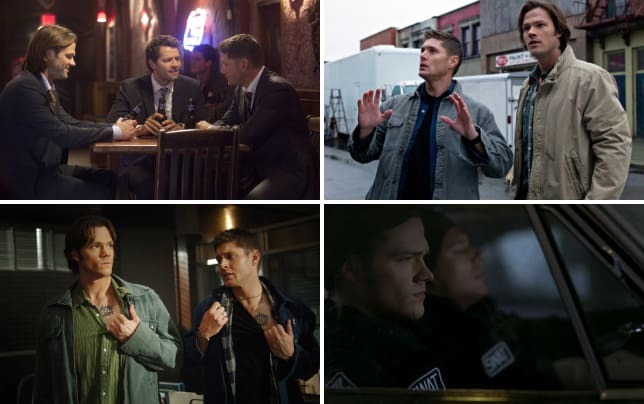 In the first Round Table for Supernatural Season 11, TV Fanatic staff writers Sean McKenna and Christine Laskodi and The Winchester Family Business’ Alice Jester and Nightsky get down to business and talk all about “Out of the Darkness and Into the Fire.” Join in the fun! Christine: Sam's speech was the complete highlight, and Jared gave it his best delivery. I can't believe that after everything they've been through, it's taken this long for one of them to address how much they've changed, especially as far as saving people and not just killing them as causalities of whatever bad they're fighting. Alice: I’m with Christine, my favorite scene was Sam’s speech to Dean in the hospital, which also happens to have my favorite quote! “What happened to us? Hunting things, we’re good at that, sure, we’re great at that, but it’s only half the bumper sticker, man.” Oh Sammy, it’s a sweet sentiment, and I’m so happy to hear that finally, but why weren’t you saying that before you let the Darkness loose? Nightsky: My personal favorite was Sam’s statement to his brother: “I get it. Do what you do. But you gotta let me do what I do, too.” That one line reflects a confident, mature Sam. He isn’t asking Dean for permission, as was the case in “Swan Song.” Sam isn’t angry as he was in “The Purge,” nor is he passively accepting Dean’s orders or desperately pleading for his brother’s recognition. Instead he knows himself and his capabilities, and that he and Dean are at their best when they work as equals. The best part of that conversation? Dean listened, trusted and accepted Sam’s plan. Sean: I was intrigued by the reveal of Dean’s bond with the Darkness and Sam getting infected, but it’s hard not to ultimately go back to the moment with Sam and Dean talking about change. I’m so glad it’s finally been said, but I’m hoping there’s some follow through, too. We will see! What did you think of the Darkness? Christine: Initially, I was surprised to see that the Darkness wasn't very frightening or eerie (at least not yet!) Considering Death's description of it, I had a very different picture of what type of villain it would be. I was leaning toward it being similar to the way the First was on Buffy, taking different shapes and forms to meet its needs. So to see another woman who was reminiscent of Lilith and of Abbadon was a little bit of a letdown for me. However, that being said, the reveal of baby Amara's mark... that changed the stakes. Alice: I’m not sure. It’s one woman? She’s a baby now? I get she’s really powerful and brings misery wherever she goes, but I had hoped for more. On the other hand, I don’t want the Darkness to be like the Leviathan where they were hidden everywhere and all had their own agendas. So yeah, killer baby, I’m on board. Nightsky: I was impressed with it’s embodiment in the woman. In my episode review I described her as “charismatic, intelligent, obviously immensely powerful, primal and eerily dangerous.” I was also intrigued and happy with the premise that it infects people, has a short gestation period then kills them. I can wrap my head around that concept. I am very disturbed by the direction they are going with the baby, however. Portraying infants, or as they grow children, as pure evil turns my stomach. Sean: I really like the concept, and the stuff with the infected, but I’m hesitant to say I love this new big bad. I think I’m going to need some more episodes with her (or is it just the baby now? ), but I’m optimistic. Will infected Sam be different than the other infected, and should he have just told Dean the truth? Christine: I'm so sick of the Winchesters keeping secrets from each other. After Sam highlighted that things need to change by not telling he Dean that he was infected, he's already backpedaling on that. Sam will end up okay, and he'll be stronger than the infection. He's the star of the show, so he has to be, right? I'm floating it out there that Sam's old demon blood thirst might be a factor. The way that they sniffed him and let him go, it felt like they knew something was different about him, beyond him just being infected. Am I stretching too far? Alice: I think Sam would react to any situation different than anyone else just because of all the crap he’s been through. I mean this guy spent time in the cage with Lucifer! He’s died a lot. He has a perspective no one else does. So yes, he’ll be trying to beat what’s happening, which is more than everyone else. As for telling Dean, I get why he didn’t tell him at that moment. Dean still needed to get Jenna and the baby to safety. However, he better be calling him soon. This might be something Dean would want to know. Nightsky: I agree with Sam’s choice to not tell Dean what had happened. Dean had just said he needed a few more hours to get the baby to safety. If he knew Sam was infected, Dean would have abandoned the deputy and baby to save Sam, which was exactly what Sam had just said they couldn’t do anymore (“save all the people, not just each other”). It will be obvious soon enough. Yes, I think Sam will be different. The hit squad smelled something in him so either they could tell he was already infected and didn’t want to kill one of their own (which would be a little disappointing) or just like in “Croatoan” his body has a way to cure or fight the illness. This option is much more interesting so to me seems more likely. Sean: I think there has to be some twist with Sam infected. Or I’m hoping. I like Christine’s idea of maybe the demon blood being a factor. But yeah, I get why Sam didn’t tell Dean, but he better tell him next episode and not drag it out, especially after Sam’s speech during the hour. After Sam's speech, do you really think Sam and Dean will change their ways? Christine: Like I said, they already aren't! Dean isn't being honest with Sam about his memories of the Darkness. Sam isn't telling Dean about being infected. While I loved seeing the return of classic Sam as an earnest guy who wants to help all people, he and Dean both know they work best when they work together. They can't save everyone if they can't even be honest with each other. Alice: Not really. I mean look at the last scene. Dean calls Sam and Sam doesn’t tell him the truth. Dean didn’t tell Sam what the The Darkness lady said either. They are definitely John Winchester’s sons. But I think they are going to think twice about doing whatever it takes to save the other, including putting people in harms way, for at least five minutes anyway. Then its back to old habits. Nightsky: I am encouraged that Dean listened to Sam. Dean adopted and executed Sam’s plan over his own, signaling that he also recognizes they have to change. I give them each one or maybe two episodes at the most to come clean with their secrets. That will be the true test of whether the lessons they have learned about working together can overcome their shame, guilt and what comes down to mistrust of the other. I will be extremely annoyed (and irritated at being lied to by Jeremy Carver) if they fall back into their old habits of secrets and lies. I think that would take season 11 in entirely the wrong direction. Sean: I’d like to see them change to a certain extent and I think both Sam and Dean should tell each other the stuff about the Darkness and the infection in like the next episodes. C’mon, guys! Let’s work together on the same page! 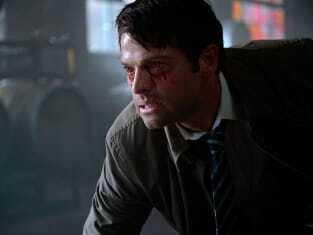 What are the angels going to do to Castiel? Christine: I really have no idea! I was a little surprised when they put the bag over his head! Whatever it is, I hope it brings about a story that's better than everything Cas did last season. I will say that no matter how many times it happens, when Castiel shows more concern for Dean's plights than his own, it always tugs at my heart strings. Alice: I said this the other day in my episode review, but Castiel better hope that Andrew Dabb, writer of the next episode, isn’t a fan of Deliverance. Because that’s what I think they would do. They seemed pretty pissed! Nightsky: Nothing good. We are being led to believe that their intention is pain for their pleasure or satisfaction as retribution for Castiel’s past “transgressions.” Their deceit and threatening actions indicate they are not sympathetic to his pleas for help. Sean: Probably nothing good. They don’t look like they are getting to sit down and have a tea party. I’m just hoping wherever it goes, we get an interesting story for Castiel. 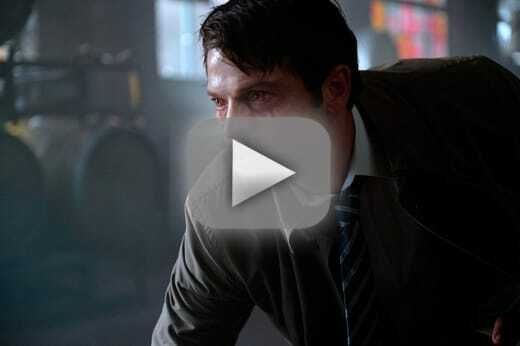 Might we see Michael, Lucifer, or heck, even Adam return in this season? Christine: I would love if we saw all three. In this instance, Michael and Lucifer might be the only people who'll have an inkling of what to do to stop the Darkness. It predates anything that Sam is going to find in the Letters library. 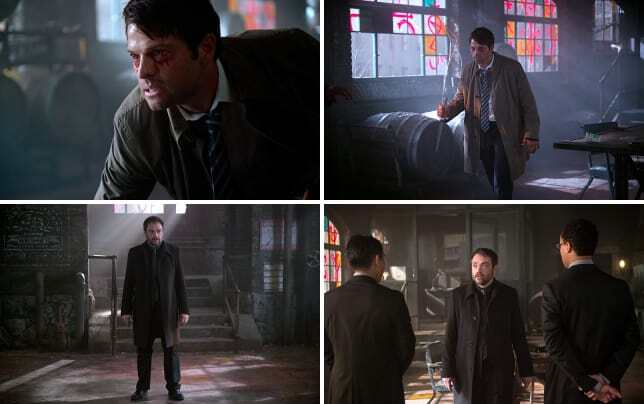 Crowley and Cas aren't going to have answers, just based on their reactions to the Darkness existing. So, it seems probable that they'll need to go to the beginning for answers. Alice: No, yes, no. Since they mentioned the cage, we are going to see at least one of them. Considering this whole MOC stuff is tied to Lucifer, that’s where I’m placing my bets. I don’t think bringing back Adam is necessary to the story, although I know fans want it. He’s been in the cage this long, he should be really messed up by now! Nope, not interested in seeing that. Nightsky: This is clearly an opportunity to resolve the open issue of Adam in Hell. The brothers might make some kind of deal to free him in exchange for Michael’s help to defeat the Darkness… with the intention of trying to get the MoC key back on Lucifer, in the cage. The enormity of that multi-year myth arc boggles the mind! Having said that, I’ve thought through the practicalities of the actors who played these parts. Michael is in Adam’s vessel so even though I believe the plotline could venture into using the archangels as allies, I cannot envision the writers bringing back an Adam who has been in the cage for centuries with Lucifer. Michael is also intent on restarting the apocalypse so that is highly problematic. I do believe however that Mark Pellegrino could effectively reprise his role as Lucifer. The writers will have to get creative in how they reintroduce Michael and Lucifer as characters (voices? dreams?). I’ve also written extensively about why I believe the brothers will find a way to destroy rather than reincarcerate the Darkness, so I think the cage’s occupants will be resources, not comrades in arms.